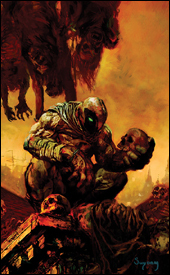 Moon Knight has been around for ages, usually within the pages of his own struggling, under-the-radar self-titled series. The current run marks the character's fourth volume of ongoing adventures (he's also had a pair of minis), dating all the way back to the very early 1980s. None of his books have lasted longer than five years. The present series is staged against the backdrop of the all-encompassing Marvel Registration Act, and the Knight's recent decision to identify himself to the government. Honestly, I'm getting a little sick of the big fuss over whether or not to register. What started as a great concept affecting the entire Marvel Universe has slowly been watered-down and disseminated to the point that it's lost what made it so invigorating in the first place. I'd always assumed that the actual registration process (and accompanying rebellion) would be just the first act of a broad, sweeping drama, but it's stalled out. It's been almost two years since the first issue of Civil War, and with all of the publisher's big players already choosing a side in the battle, what we're seeing now in books like this one just doesn't captivate me. What worked on the larger scale of that initial crossover is becoming redundant now that it's been repeated on a much smaller scale in individual books. It time for the second act, but nothing seems to be forthcoming. While writers Mike Benson and Charlie Huston do touch on Knight's recent registration in this issue, it's only in passing and carries little or no weight, which is strange because I don't know what else they really intended to accomplish. This writing is such recycled crap that I'm amazed it's still finding a place for publication. It's cover-to-cover excess, blood and guts with a brief respite before delving into more meaningless violence. Their characterization is nonexistent and shallow — the only difference between characters is through their glaring physical abnormalities. Marc Spector (Moon Knight himself) has a big scar near one eye. Another character has no legs and a wheelchair. Another wears red sunglasses. This is the only way to tell them apart, because everyone speaks with the same vacant bravado, the same lack of personality. Mark Texeira's artwork is disturbingly bad throughout the issue. Here's a guy whose rough-edged, textured style set him apart and made him one of my favorites in the 1990s, but evidently the years haven't been good to him. I can't remember the last time I was genuinely moved by his contribution to a series, and he does nothing to remedy that situation with such a half-assed, trashy showing here. His work in this issue is straight-up garbage, which is something that's as painful to report as it was to observe. This is a guy that I used to put up on a pedestal beside Bill Sienkiewicz and Jae Lee — a trendsetter who pushed the boundaries and proved that comics could be both legible and abstract as an art form. How the mighty have fallen. Although it came in at the very last possible moment, this is clearly the worst book I've read all year. It's nonsensical writing, presumably only there to entertain the writers' tame imaginations, paired with exceptionally bad artwork. It's a formerly entertaining character (and artist) at his absolute worst. It's a train wreck, honestly, and I can only hope it will follow the path of its predecessors in missing its fifth anniversary. Hell, I hope it misses its second. Skip this, skip this, good lord just skip this.